Just note that the Japanese, they are the same panel, the curtains are a bit different from the usual for us appearance of two parts of the matter, which freely move along the cornice or guides. 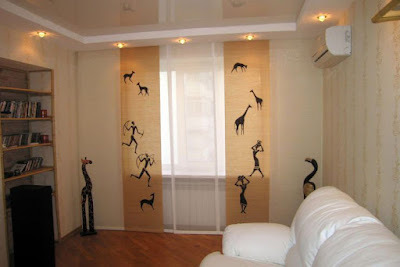 What are the features of the Japanese version of the textile window decoration? Japanese curtains are a set of fabric panels that are fixed between two horizontally located guides. Each guide has several parallel "runners", along which the panels move. The fabric panel is stretched between two fixing slats, the top, and bottom. Planks move in their guides, opening or closing the window. In the construction, there is always one or two fixed panels. Behind them lined up dynamic elements, when you want to let in daylight into the room. Static panels can be located on the sides of the window niche. In this capacity, one bar, fixed in the middle, can act. 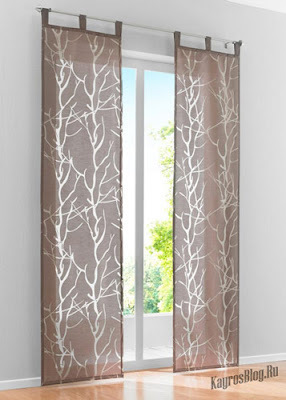 When the window is open, the panel looks like a column decorated with textiles. 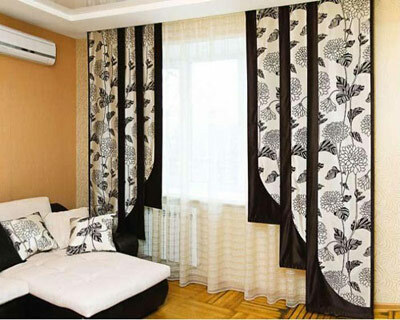 As a rule, Japanese curtains are made in size from floor to ceiling. 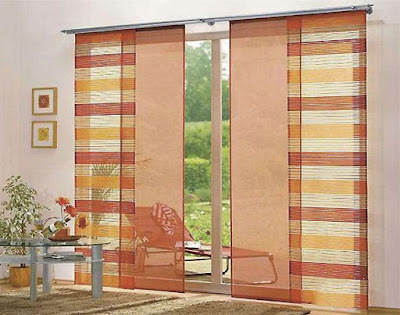 However, for very long or wide windows there are special designs of a shorter size. The lower guides are located on the windowsill. Such variants are rare, as they only look good in huge window openings. But for the design of balcony blocks, Japanese curtains are used much more often. They perfectly drape an asymmetrical opening. Panels, behind which the balcony door hides, cannot even be moved without special need. In general, the design of Japanese panel curtains is a bit like vertical blinds, only the panels can not rotate, but only shift, the width of textile elements of Japanese curtains is also much larger than the blinds. For fabric design use, most often, natural fabrics of pastel colors, as prescribed by the authentic version. However, in the last few years, more and more variations have appeared. 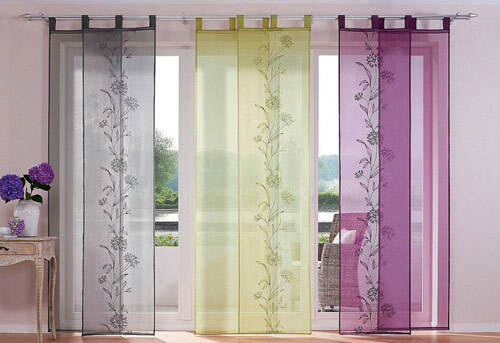 There are already patterned and even embroidered panel curtains, and the abundance of bright and non-standard color options can plunge even the restrained Japanese into amazement. So, recently in one of the magazines was published the design of Japanese door curtains, in which each of the panels was painted in an uncompromisingly bright base color of the rainbow spectrum. 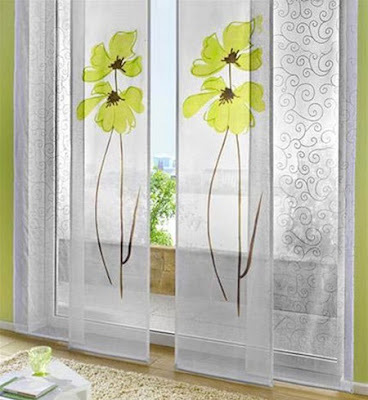 Unusual design for our latitudes is not the only advantage of Japanese curtains. Especially since the inhabitants of the country of the rising sun are well known for their practicality. 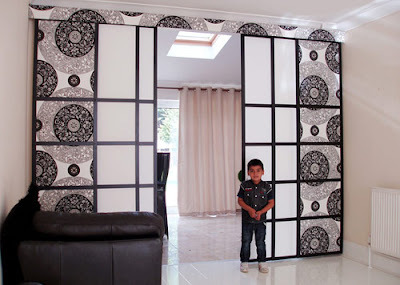 What are the advantages of Japanese curtain panels for a living room? The natural fabric, which in the vast majority of cases is used for their manufacture, is absolutely safe for human health. 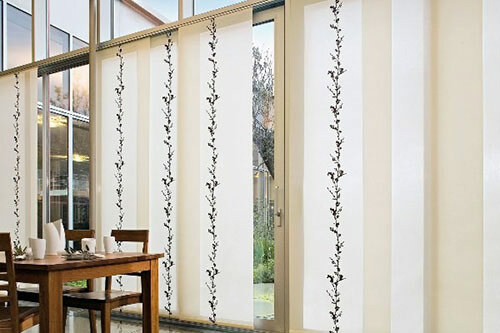 Japanese curtains panels help create a single, harmonious and healthy living space. Smooth, smooth surface, not forming folds, waves, and creases, does not allow dust to linger. Therefore, Japanese curtains are hypoallergenic. And if the fabric is also treated with an antistatic coating, it helps them to keep a fresh and clean appearance for a long time. After all, with this treatment, dust and dirt do not settle on the surface of the fabric. 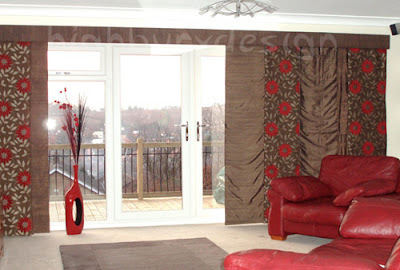 The design of curtains allows you to combine them, as you please. Popular alternation of transparent and dense strips of tissue, or monochrome and patterned. You can combine different in texture and pattern, structure and fabric density, getting original and stylish combinations. Despite the abundance of structural elements, they are easy to care for. If necessary, they can simply be removed from the skeletons and washed, like the most common fabrics. The design of the cornice allows you to choose any configuration of the movement of panels - to the right or left, or to two sides. 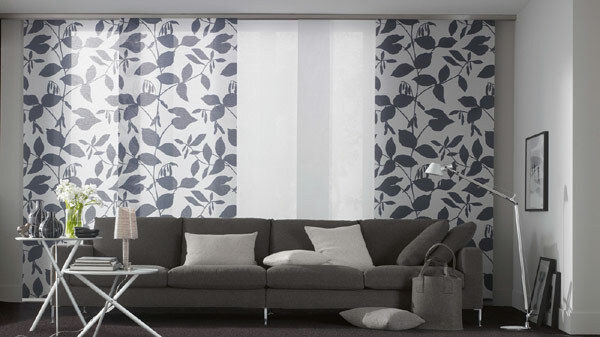 The fastening system allows you to use Japanese curtains, not only for window decoration but also as interior partitions or screens. 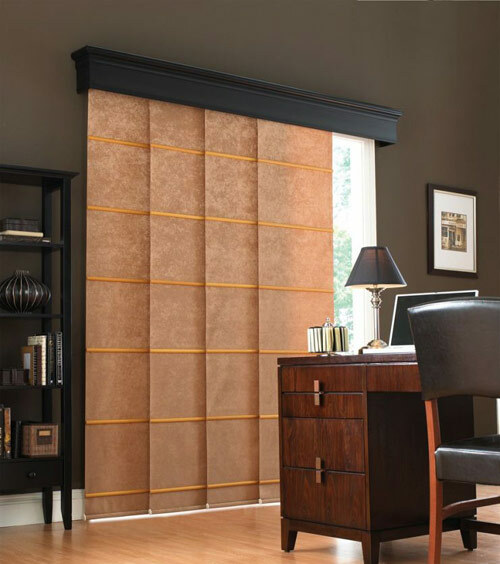 Choosing a different density of tissues, you can vary the appointment of curtains, from light, almost transparent today, too tight light-shielding options. Japanese curtains panels are easily replaceable. If the design is boring or seems outdated, or you just want to refresh the image of the room, you can replace the fabric panels simply and quickly, and the price of such a replacement will add up to the cost of the fabric that will be used in the new design. 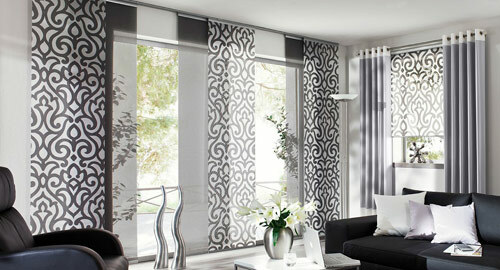 The use of Japanese curtains in modern interiors goes far beyond the exotic oriental style. 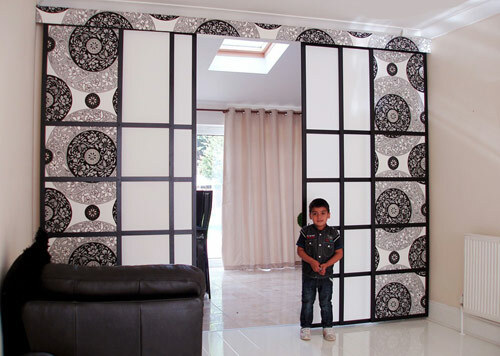 Japanese curtains panels perfectly fit into modern functional urban designs. Usually for such interiors choose dense and smooth fabrics of smooth weaving, pastel shades. The most popular backgrounds are beige, gray, milky and vanilla colors. It is in the urban style began to actively use the possibilities of combinations of panels. On the basic background, one or two contrasting, bright stripes of fabric look great. For example, for a pearl base shade, striped curtains with alternating saturated green tones are often used, and beige panels are complemented by a pair of patterned, with whimsical coffee-colored curls, similar to chocolate ornaments. 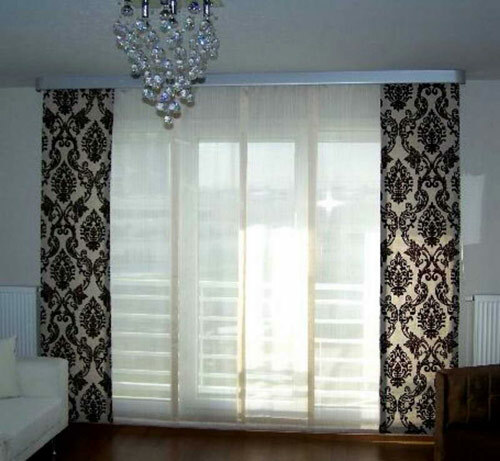 Functional Japanese curtains also fit into the strict Scandinavian style. For such interiors, light fabrics of light cold tones are preferable. It is quite appropriate to embossed ornaments on individual panels, but it is not too fond of decors - Scandinavian style is known for its desire for minimalism. Modern interiors in high-tech style are perfectly complemented by Japanese panel curtains. Laconic design and unusual appearance, the original design solution is ideally integrated into the stylish high-tech concept. 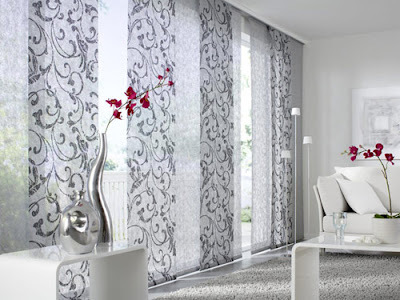 If you use fabric for fabrics with a content of metalized threads, the curtains will be an ideal addition to the modern technological interior. 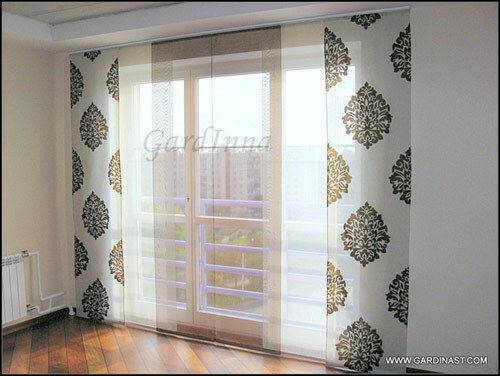 Such Japanese curtains have also proved themselves in minimalist interiors. 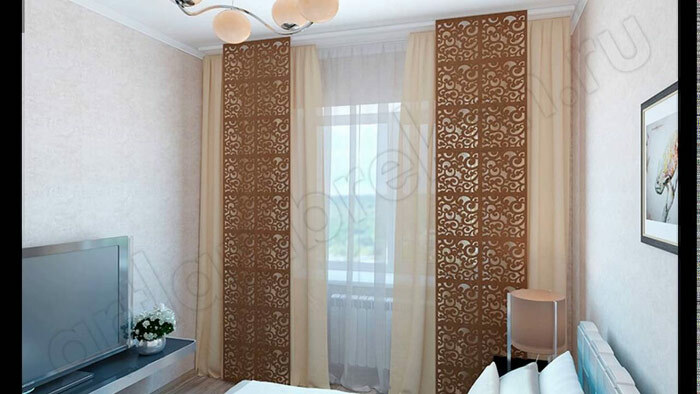 Here, all the interior advantages of the Japanese curtains panels are fully revealed - elegance and simplicity, the possibility not only to decorate the window but also to create a beautiful interior accent, which is needed even in the strictest laconic interior. 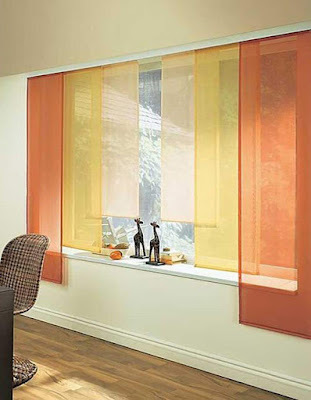 It should be noted that, despite all its advantages, panel blinds are not appropriate in all areas. They are not recommended for use in a children's room where there is a small child or several children. The design can be easily damaged during games. 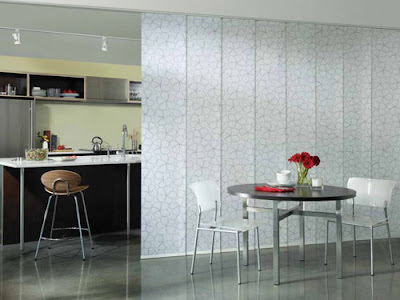 For small kitchens, panel blinds do not fit too well. They can be contaminated or even damaged due to the tightness and proximity of the work surfaces. In the kitchen with large windows, you can use a shortened structure, which has the advantage that it leaves the space under the window free and even functional. But for living rooms and dining rooms, the Japanese version is just perfect. They allow you to create a special, incomparable atmosphere of good taste. 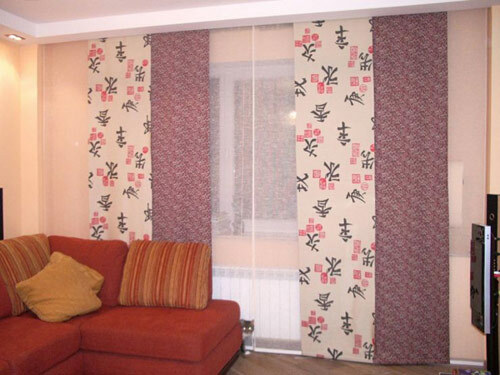 Japanese curtains style are often used to decorate gala halls, restrooms inexpensive office buildings, and other public spaces. 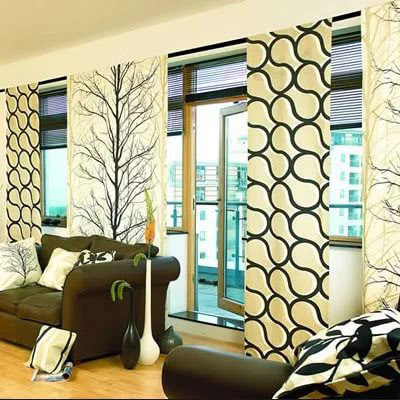 The most widespread was such curtains in ethnic and directly, in Japanese interiors. In order to create an authentic Asian accent, they fit perfectly. As a rule, designers try to use natural and natural materials for panels - wood, fabrics of natural origin. Very stylish look Japanese curtains of rice paper. They miss a lot of light, reliably protect from prying eyes, give a special, incomparable color, which is so appreciated by connoisseurs and lovers of this style. Use natural materials. In the historical homeland used rice paper, the only requirement for it - the density. Could be weaved from jute, straw, sisal. Used bamboo. Now we use fabrics that can be both natural and artificial. Initially, the curtains were monophonic. Their main task was to divide the room. Now color fulfills and design role. It is important to consider when choosing a color, so that several panels, different in color and material, are in harmony with each other and with the interior of the room. When choosing a fabric, natural dense ones are desirable because they keep the shape well. 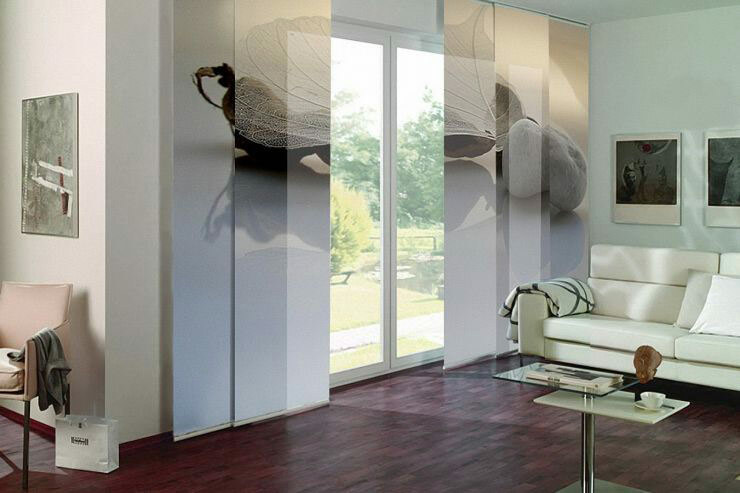 You can combine them with panels from translucent natural fabrics. It should be noted that natural fabrics are more environmentally friendly since less attract dust. 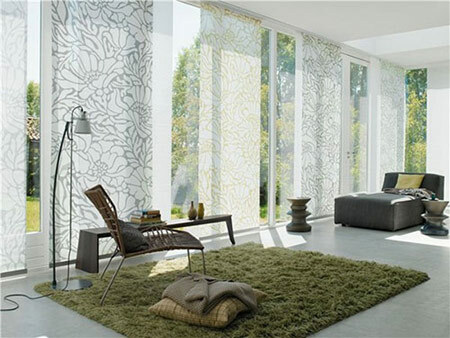 Designers recommend for the interior, made in a minimalist style, to choose plant motifs or a small geometric pattern. For other styles, you can use bright colors. Beautiful look on the Japanese curtains panels ornaments. The main thing that the landscape looked man-made. It is very easy. Now on sale even there are pre-cut for Japanese curtains canvases, you can also buy a curtain rod for Japanese curtains and accessories for them. If you did not buy these blanks, then first determine the amount of tissue. The width of the panel should be 60 cm plus 8 cm (4 cm on the right and left on the allowances). The length is defined as the length of the floor and the cornice. To this should be added 20 cm (10 cm above and below on the allowances). 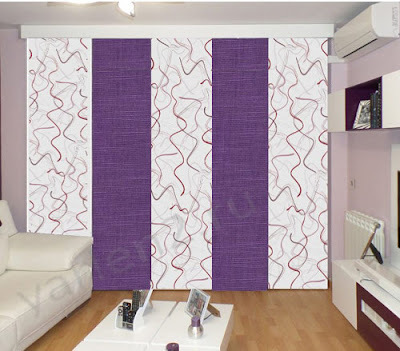 It is necessary to cut the fabric into strips. Then sew side seams. For a thin fabric special seams, fiberglass or plastic are inserted into the seams. The result is a skeleton. It is recommended for an even edge to apply glue on the joints of non-woven, You can use "velcro" for these purposes. Iron. Below you need to make a Kaliska. In it is inserted a weighting agent. Above - Velcro. And you can hang curtains. Next is a photo of Japanese curtains, how and where they can be used. 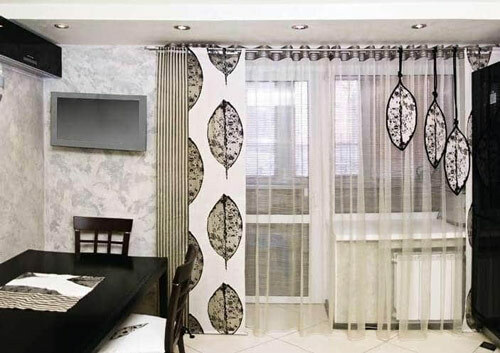 Japanese curtains in the interior are attractive, first of all, with beauty, unusual and elegant appearance, high functionality. They have become ubiquitous in our latitudes, and anyone can buy them to fill their home with the elusive charm of a mysterious Japan.